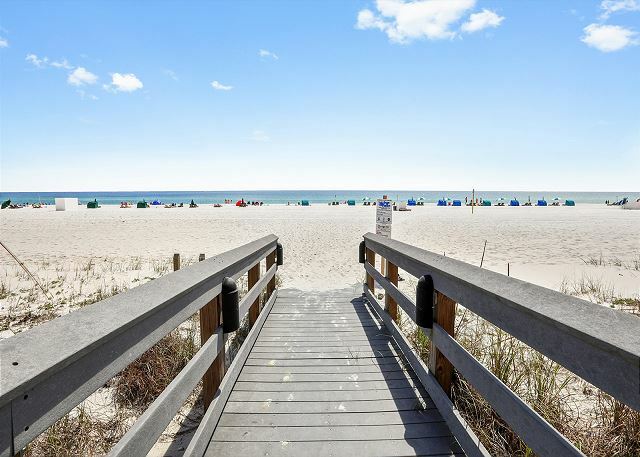 Gorgeous panoramic views of the Gulf from the master bedroom, the living area and large balcony as well as fun beach decor with tile throughout make this 1,675 square foot, three bedroom, two bath eighth floor condominium a renter's favorite. Fully appointed kitchen includes ice maker, microwave, dishwasher and laundry area with full size washer and dryer. Extra kitchen amenities make it easy to cook a relaxing family meal or for entertaining guests with a gourmet meal. Other features include 9 foot ceilings in the living and dining room, ceiling fans, central heating and air conditioning, and a large master bath with whirlpool tub, separate glass enclosed shower, double vanity and lots of closet space. Our unit is family-friendly with enough space for the little ones. Each year we make our way to the gulf coast to enjoy the sea, the sand, the food, the view, etc. We discovered Seachase several years ago and have stayed here ever since! We chose 801w for the first time last year. It has everything we needed. Beds are comfortable, perfect unobstructed view, very clean and tidy. Preparing to book again for next year! A very nicely decorated and spacious condo with a beautiful view. When we walked in I immediately let out a sigh of relaxation. The condo was just like the pictures: airy, open, beautiful view, and well cleaned. My husband, two kids and I had MORE than enough room to stretch out and enjoy our own space. We even said we might book this condo again and invite a couple friends. 801W Sea Chase was a wonderful condo. Very clean, efficient and handy to everything. One of the best rentals we have ever had. Will definitely rent again. Our second winter in 801W, but our tenth at SeaChase. Cannot say enough about the staff that always make us feel like we are home. Absolutely the best location in Orange Beach on many levels. The buildings and grounds - outstanding! The beach. The shopping. The restaurants. The entertainment venues. There are views from every room in 801W but the views of beach and pool areas cannot be matched. Breathtaking. So glad you enjoyed your stay at SeaChase and in 801W in particular. See you again next winter! A few days or a winter retreat, SeaChase is always our preferred residence. Weve referred SeaChase to several friends and relatives for their summer or winter travels. We are so happy you are enjoying your stay with us! Please let us know if there is anything we can do for you while you are here. Once again, enjoyed this unit! Felt like we were HOME in 801W! SeaChase is THE place to enjoy the Alabama beach. The condo, grounds, buildings, and especially the entire SeaChase staff, are top notch.